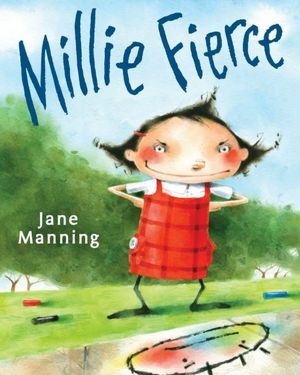 Posted on January 4, 2013 by Patricia Tilton •	This entry was posted in Jane Manning, Perfect Picture Books and tagged Acceptance, Differences, Humor, Self-esteem. Bookmark the permalink. Thank you Catherine. I enjoyed this book a lot and kids will certainly identify. Sounds like a good book to share with children. I remember feeling like a smudge when I was a child, and several times as an adult. I know I felt like a smudge when I was a child — or back then we said “wall flower.” Great discussion book. I’d like to read this Pat. I think it is a terrific topic. What happens to Millie? Does she need to be noticed by everyone, or does she just need one special friend? Great PPBF choice! It is a terrific topic — one we can all identify with. In the beginning she feels totally invisible. She finally has enough and decides that the only way kids will notice her is if she becomes outrageous and fierce, which gets her into trouble at the end. Then she really wishes she was invsible again. There is a satisfying resolution. Feeling invisible and perceived as a smudge … beautifully written and something I know that kids will connect with … cause I just did. Thanks, Pat! Barbara, I connected right away. I’ve even had moments as an adult where I’ve felt that way. So it is a good parent/child read. Great for the classroom too. I LOVE Millie!! That cover is great! I hope that she figures it all out in the end. It’s so hard being a kid sometimes! I’m anxious to check this out and see how it turns out! Thanks for sharing! You can’t help but love Millie and all of her antics to get noticed. Yes, there is a satisfying ending. Kids will laugh and identify. What child hasn’t felt invisible? What adult hasn’t felt invisible? These days, only the twenty-somethings seem to get any attention. I think there are times both children and adults feel invisible, so it is a good discussion book with a child. It’s also very funny, to make the point. Regarding the 20-year-olds, they are in their own zone and desperately trying to be noticed. Can always count on you to add an interesting point. I think I know Millie! ….I think I know a hundred Millies. I totally agree. This would be a wonderful classroom resource. Ha! HA! As Michael Offutt pointed out — look at the 20-year-olds today. On a serious note, kids and adults don’t like to be invisible. Millie is a fun character! That’s what I like so much about Millie — she is outrageous! So kids will be amused and shocked a the extremes she goes through to get someone to notice her — but as we know there is a message here. Great story for all children — and adults. I felt that way when I read it. I know I have had moments were I walked into a room of people as an adult and felt totally invisible. This sounds wonderful, Pat, and addresses such an important topic with kids, one we really don’t have well represented on the list so far so I’m really glad you chose this book! Thanks for a great recommendation! Susanna, I’m happy you enjoyed the selection. This book was very different, but one that children definitely can relate to — even adults. I think we all know what it feels like to be invisible. Somehow I missed your commet. I think this is a great book for the classroom! Kids will get the message and love the humor. Millie reminds me a bit of Mean Jean THE RECESS QUEEN. Have you read that one? Somehow I missed your comment. No I haven’t read that book. THanks for telling me about it as I will check it out! I love the opening sentence! You’ve got me hooked again! Julie, this is such a great book for kids. I couldn’t help but fall in love with Millie — we can all identify with her! Cute book with a universal message. Love it Pat. I know I quite liked being the quiet invisible one…lol. I felt more invisible as I reached 5th-6th grades and up. Wasn’t that way as a child. It is a universal message. What an appealing opening! I must find this one. It sounds great. Great for the classroom. Haven’t seen anything else like it yet. Excellent subject; excellent quote from the book that is instantly captivating. Yes, the author catches your attention immediately with her opening. Thank you for sharing on Twitter. Sounds like a great book — and I love that opening sentence! Thanks, Pat! Glad you liked the selection, Beth. Yes, I liked the opening to. Very clever. Glad you enjoyed the book review Erik. She really is an adorable character, even when she’s fierce.